MDSP 77 Bike Turnout Project Officially Signed! March 19, 2019! 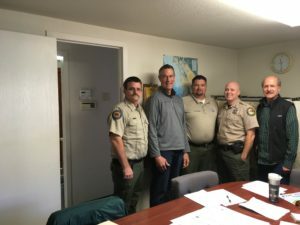 Mount Diablo Cyclists Collaborated with California State Parks to create the MDSP Bike Turnout Project to Install 77 Bike Turnouts on Mount Diablo! Officially signed, but needs to be funded! We are working with State Parks to fund Phase I: 15 Highest Priority Bike Turnout Locations on the most dangerous Blind Curves! Mount Diablo Cyclists and State Parks collaborated to install double-yellow centerline and the advisory signs on the roads of Mount Diablo State Park. Our Partnership has resulted in a decrease in the number of traffic collisions on those roads. However, as judged by surveys from drivers and cyclists, and by our own personal experiences, these improvements are not enough. It remains not a question of if, but when the next Bike vs Vehicle Collision will occur, resulting in a serious injury or possibly a fatality. 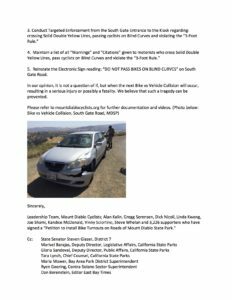 Please refer to mountdiablocyclists.org for further documentation and videos. Our concern is the high number of near-miss and the actual collisions involving cyclists. On a typical weekend day, up to 500 drivers share the roads with approximately 700 cyclists. According to some estimates, over 150,000 cyclists rode up Mount Diablo last year. 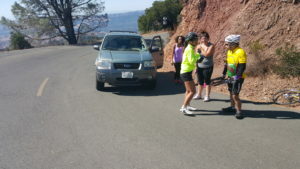 The majority of vehicles on Mount Diablo are now bicycles! According to Park Leadership and supported by the responses in our Motorist Surveys, “most motorists entering the Park have never been to Mount Diablo before and are unaware that they will share the narrow, winding roads with hundreds of cyclists.” 128 cyclists completing a recent survey reported a total of 336 unsafe passes on blind curves while riding up the mountain. Given that only a portion of the total cyclists riding in the park that Saturday completed the survey, the total estimate of unsafe passes would be over 1,000. Considering the number of cars, bikes and pedestrians on the park roads that day, it is remarkable that there were not serious accidents. The following describes the situation that occurs on a very frequent basis: an uphill-bound motorist decides to pass an uphill-bound cyclist, presumably to be able to drive up the mountain faster; in order to do so, the driver elects to cross over the centerline, despite the fact that it is double-yellow; the driver thus enters the downhill-bound lane of traffic, directly in the path of a descending car, truck or bicycle. If there is a vehicle in the descending lane, still unseen by that ascending/passing driver who is now in that lane also, there is a high probability of at least a near-miss collision, if not an actual collision of the two vehicles. If that descending vehicle is a cyclist, a serious injury or fatality can occur. 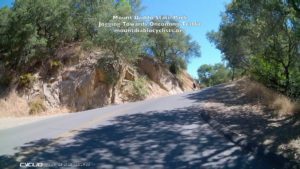 There are more than 300 curves on the roads of Mount Diablo, many of which are blind curves, and this scenario takes place on virtually every ride for some of us. Even if we stay to the inside of every curve, and proceed slowly as we descend, we are very vulnerable when an oncoming car crosses the centerline and suddenly appears right in front of us, partially or almost completely blocking our lane. It is a chilling, unforgettable experience; but it is preventable. There are several safety projects that, if implemented, will improve the safety for cyclists and motorists. But at the top of the list are Bike Turnouts. Bike Turnouts have the potential to significantly reduce the high number of near-miss and actual collisions involving cyclists, especially on blind curves. The majority of collisions and near-miss collisions occur on or near blind curves. 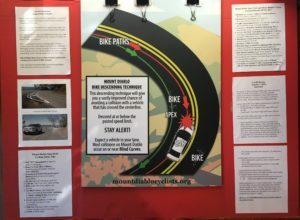 The Leadership Team of Mount Diablo Cyclists looks forward to continued collaboration with State Parks to improve the safety for all who enjoy the roads on Mount Diablo. 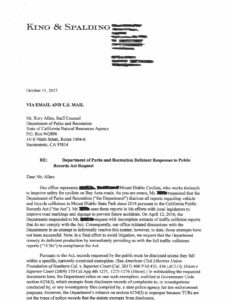 On July 13, 2018, the Staff Counsel for California State Parks responded to our Public Records Act Request: "It is my understanding that there are no restrictions for joggers or pedestrians running or walking in the opposite direction of car and bicycle traffic on Mount Diablo State Park roads." If you have any questions or suggestions for Park Leadership, please contact: Ryen Goering (Park Superintendent) (925) 890-4403 or (925) 673-2895, ryen.goering@parks.ca.gov and info@parks.ca.gov Please share his response with us. Thanks for helping to improve the safety for cyclists, pedestrians, joggers and motorists on the roads of Mount Diablo! Mount Diablo Cyclists (MDC) leadership was invited to meet with State Parks leadership in the Capitol on May 29, 2018, to discuss topics addressed in the letter written by Vince Anibale on April 27. 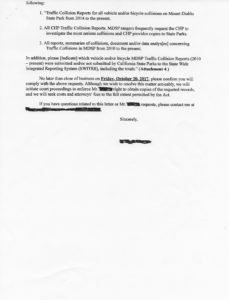 Our chief concern was that the letter stated that “priority” projects in Mount Diablo State Park would be “pursue(d) within the next two years.” This timeline is vague, non-committal and addressed Bike Turnouts, but not the delivery of the Verbal Motorist Safety Advisory to all drivers entering the Park, or several other issues that State Parks is aware are of high priority to MDC. The final resolution was that MDC would receive a response via email on June 4, detailing the timeline for completion of the Project Evaluation Form regarding construction of additional Bike Turnouts. It's not a question of if, but when the next Bike vs Vehicle Collision will occur, resulting in a serious injury or possibly a fatality. The installation of the double-yellow centerline and the advisory signs on the roads of Mount Diablo State Park has been associated with a decrease in the number of traffic collisions on those roads. However, as judged by surveys from drivers and cyclists, and by our own personal experiences, these improvements are not enough. It remains not a question of if, but when the next Bike vs Vehicle Collision will occur, resulting in a serious injury or possibly a fatality. There are several safety projects that, if implemented, will improve the safety for cyclists and motorists. But at the top of the list are Bike Turnouts. Bike Turnouts have the potential to significantly reduce Bike vs Vehicle Collisions, especially on blind curves. The majority of collisions and near-miss collisions occur on or near blind curves. In 2016, Park Leadership and Mount Diablo Cyclists collaborated to design and install 3 Bike Turnouts as a pilot study. In September 2017, we collaborated with Park Leadership to identify locations with sufficient pavement to install 10 more Bike Turnouts for a total cost of less than $5,000. Finally, after a letter from State Senator Glazer and Assemblywoman Baker, these 10 were installed in February 2018. Bike Turnouts are supported by elected leaders, Mount Diablo State Park Staff and volunteers, the California Highway Patrol, Bike East Bay and other cycling organizations, and a petition with over 2,600 signatures. Surveys from motorists and cyclists alike, and video images all support the potential of Bike Turnouts to significantly reduce collisions, injuries, and possibly fatalities. In September 2017, Park Leadership and Mount Diablo Cyclists identified 48 locations for Bike Turnouts that would require construction. In December 2017, Park Leadership added an additional 29 locations, for a total of 77. Many of these potential Bike Turnouts locations are where past collisions (160+) have occurred and will occur again if we do not act quickly to install Bike Turnouts on the roads of Mount Diablo. 1.) When in 2018 will State Parks install 10 additional Bike Turnouts on the most dangerous blinds curves? 2.) When will State Parks install permanent signs at the 13 existing Bike Turnouts? 3.) When will State Parks approve and fund the MDSP Bike Turnout Plan? We believe that the ultimate goal of preventing Bike vs Vehicle Collisions, and the potentially fatal consequences thereof, more than justifies the investment. When will the Verbal Motorist Safety Advisory be given to all drivers entering the Park? This safety message is vital, but can only be provided to a driver if there is someone stationed at the entrance kiosks. For years, the kiosks at North and South Gate have been staffed less than 50% of the hours that the Park is open. Therefore, many motorists never hear that message. Consequently, they pass cyclists on blind curves, unwittingly causing a near-miss or an actual head-on collision. When will the Park implement a process to eliminate, by some estimates, lost revenue of over $100,000 per year in uncollected fees from these motorists? According to Park Leadership, when the kiosks are not staffed, many motorists never stop to pay. State Parks could utilize that revenue to save lives of cyclists and enhance the experience of all visitors to the Park. When will the Park implement and publish an accurate count of cyclists entering via the North and South Gates? Publishing true and accurate Free Day Use (cyclist) historical data is essential for many reasons; it is important for State Parks and elected officials when making informed budgetary decisions. When will the software license agreement that GOGovApps (Mount Diablo App) sent to State Parks on 2/9/2018 be approved? It’s a free usage agreement for 6 months that would give State Parks adequate time to conduct a no-risk evaluation. Below is a list of additional safety concerns, ideas and suggested projects. We look forward to working with State Parks to establish a completion date for each project, and then to getting started. Publish Non-Emergency phone number (916) 358-0333 for Near-Miss Collisions, Road Hazards or Unlawful activities. Post in Park, on Web Site, Facebook page and in Park Visitor handouts). 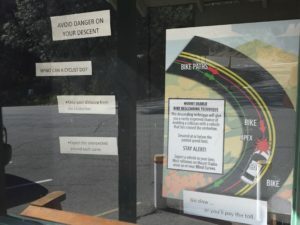 Mount Diablo Cyclists looks forward to collaborating with California State Parks to improve safety for cyclists and motorists on the roads of Mount Diablo State Park. The Leadership Team of Mount Diablo Cyclists held their monthly meeting on April 6, 2018. The information below highlights our current progress toward increasing safety for cyclists and motorists on the roads of Mount Diablo. Bike Turnouts – Creating Bike Turnouts is one of our two top priorities. MDC leadership strongly believes that Bike Turnouts will save lives and reduce injuries. 13 Bike Turnouts have been constructed or painted to date; 64 additional turnouts were proposed by MDSP leadership in 2017. These have not yet been approved by State Parks. We need to enlist support using the change.org petition, letters to State Parks from as many cyclists as possible, and via the leverage provided by our elected officials and the media. This method was successful in 2015 in the installation of the double-yellow centerline and the advisory signs, and should be successful in this campaign for additional Bike Turnouts. Verbal Motorist Safety Advisory – Providing a brief but thorough VMSA to all drivers is our other top priority. The two entrance Kiosks are staffed less than half of the hours that the Park is open. Therefore, thousands of motorists enter the Park every year without the opportunity to hear the VMSA from a Park Aide. State Parks has been aware of this situation for over 10 years. They are also aware that full staffing would easily pay for itself with the increased number of fees collected. MDC has proposed several solutions for this issue to Park leadership over the past 2 years. No significant change has been made. Additional Motorist Survey – an enhanced survey form has been developed, and will be used at the Summit in the near future. Our goal is to obtain responses from an additional 100 drivers before Sept 1st. MDC Website – Latest Update tab will contain current information that will be permanently located under the appropriate tab. Results of surveys, letters to and from State Parks officials and more will be available. Upcoming Meetings: The MDC Leadership Team will continue to meet monthly. We will also meet in May or June with representatives from the offices of State Senator Steven Glazer, State Assemblywoman Catharine Baker, and State Assemblyman Tim Grayson. There aren’t many things that can spoil a bike ride on a beautiful spring day in Mount Diablo State Park. On March 27 however, such a thing happened, again, and more than once, in less than one hour. This all-too-common situation is easy to envision: an uphill-bound car decides to pass an uphill-bound cyclist, presumably to be able to drive up the mountain faster; in order to do so, the driver elects to cross over the centerline, despite the fact that it is double-yellow, and enter the downhill-bound lane of traffic. There are more than 300 curves on the roads of Mount Diablo, many of which are blind curves. On such a curve, if there is a vehicle in the descending lane, still unseen by the ascending/passing driver, there is a high probability of a near-miss collision, or of an actual collision of the two vehicles. If that descending vehicle is a cyclist, a serious injury or fatality can occur. This scenario takes place on virtually every ride for some of us. Even if we hug the inside of every curve, and proceed slowly as we descend, we are very vulnerable when an oncoming car crosses the centerline and appears suddenly right in front of us, partially or almost completely blocking our lane. It is a chilling, unforgettable experience; but it is preventable. Under your leadership, the double-yellow centerline was painted, and advisory signs, admonishing drivers not to pass bikes on blind curves were installed in September 2016. A Verbal Safety Advisory Message was approved by MDSP leadership in 2017, and has been posted inside the two entrance kiosks at the Park. The attendant on duty can simply read the Advisory Message. Any questions from the drivers can be addressed at that time, while the entrance fee is being collected. But despite these safety improvements, many drivers continue to illegally cross the centerline and endanger cyclists and motorists every day. One reason for this is that drivers enter the Park when the kiosks are closed. If that happens, the Advisory Message is not provided, no instructions are given, and no questions addressed. March 27 was such a day; the kiosks were closed again. Unfortunately, according to the most recent data provided by State Parks, they were closed 46% of the hours that the Park was open in 2016, or almost half of the time! If motorists do not receive the Verbal Advisory Safety Message, and do not have the opportunity to clarify questions with an attendant, they are at a greatly increased risk of driving unsafely, and endangering cyclists and other motorists. 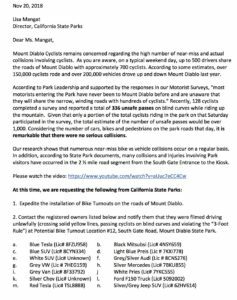 Mount Diablo Cyclists, on behalf of all who enjoy visiting Mount Diablo State Park, ask you to consider this issue seriously and expeditiously. We believe that the existing kiosk staffing can be supplemented with a combination of volunteers and paid Park Aides to allow both kiosks to be open whenever the Park is open. Attendant costs would likely be offset by increased revenue. We urge you to take the appropriate action soon to accomplish this, before that preventable fatality occurs. It is also unfortunate, according to Park leadership, most of these motorists who enter the Park before the kiosks are open do not stop to pay the entrance fee. In addition, there is nobody to make change, answer questions or give directions. According to a Channel 7 news story some cyclists report (10/23/15), "near-misses every third ride." MDC Junction Display Removed and Disassembled! We cannot express how disappointed we were to find out on Saturday (2/17/18), that the Supervising Ranger returned to work after ten days leave and arbitrarily removed, and disassembled the Mount Diablo Cyclists Display at the Junction Ranger Station. The MDC Display had been approved by Park Leadership on 2/5/17 for the months of February and March. In addition, without our permission, the Supervising Ranger used our poster in his display (photo below), covering up mountdiablocyclists.org. Which gave the impression that State Parks created and funded the Mount Diablo Bike Descending Technique Poster! The Definition of Interpretive: serving to instruct or enlighten or inform, which is exactly the purpose of the MDC display! In addition, the synonyms for interpretive: graphic, explanative, illustrative and instructive describe the MDC display! 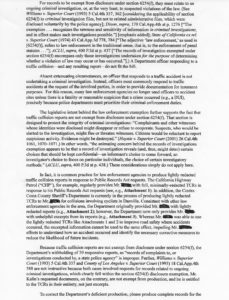 We submitted a Public Records Act Request to California State Parks on April 12, 2016. Here's one of the New Bike Turnouts being used. by two cyclists! Turn up the volume and enjoy the music in the car as it passes two cyclists on a Blind Curve! Special Thanks to all the members of Mount Diablo Cyclists for supporting Bike Turnouts on Mount Diablo! Feb 1, 2018 was a historic day on Mount Diablo! Ten Bike Turnouts were installed/painted: Total cost $5,000! Special Thanks to State Senator Glazer, Assemblywoman Baker, Ryen Goering and Monte Rowan for their leadership to install Bike Turnouts on Mount Diablo! We now have 13 Bike Turnouts on Mount Diablo. According to Ryen Goering, Park Superintendent and Monte Rowan, Chief of Maintenance: “This is just the beginning. We are in the planning stages to install up to 64 more paved Bike Turnouts and we hope to send these plans up to Sacramento for approval." We have a long way to go, but with your continued support Bike Turnouts will be installed on Mount Diablo. Thanks for all your advice and support to improve the safety for cyclists and motorists on Mount Diablo! "Shami 500th!" Joe Shami (83yrs young) completed his 500th consecutive weekly ride up Mount Diablo on Jan 14th. That's every week for the last 9 yrs and 32 weeks! Joe talked the entire way as he visited with over 50 cyclists who accompanied him. It was a very special day on the mountain. You meet the nicest people on Mount Diablo. News Years Day 2018 on Mount Diablo! Approximately 700-800 cyclists rode up the mountain! WOW! The majority of vehicles were bicycles! Great day and perfect weather for the 1st Annual MDSP Safety Event! Special Thanks to the Park staff, volunteers and all the visitors who rode, walked or drove up to the Summit! You meet the nicest people on Mount Diablo! A revised VMSA was drafted. MDSP will finalize and distribute soon to kiosk staffers. 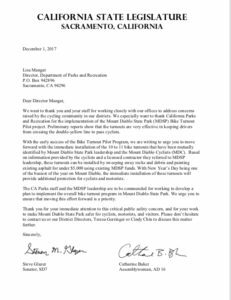 Dec 1, 2017: It's our great pleasure to share this letter from State Senator Steven Glazer and Assemblywoman Catharine Baker, concerning Bike Turnouts on Mount Diablo. Your elected representatives should be commended for their bipartisan leadership! Over 3,000 Signatures on the Bike Turnout Petition! Please sign/share the change.org petition to install Bike Turnouts on the roads of Mount Diablo.